Monfalcone, Northeastern Italy, is the site of large shipyards. These began their activity in 1908. The Monfalcone district has been characterized as an area at high incidence of malignant mesothelioma and shipyard work has emerged as the principal cause of mesothelioma in Monfalcone. , Studies conducted on a series of 3,640 consecutive necropsies showed that in the Monfalcone shipyards, asbestos exposure was an ubiquitous phenomenon, often reaching high levels. Recent studies have been conducted, aimed at obtaining data on the magnitude of mesothelioma risk in the Monfalcone shipyards as well as the features of such tumor in different periods. In a series of 2,776 persons hired in 1942, 18 pleural mesotheliomas were diagnosed in the period 1981-2005. Of 1,637 workers hired in the period 1960-1969, 17 had a diagnosis of pleural mesothelioma. In the present study, people hired at the Monfalcone shipyards in the period 1950-1959 were investigated. The Chi-square and the Student's t-test were used to compare the prevalences of mesothelioma in the various age groups at hiring time. In the period 1950-1959, 1,403 workers (1,375 men, and 28 women, aged between 14-59 years) were hired at the Monfalcone shipyards. The age distribution of the male workers is reported in [Figure 1]. The [Figure 2] shows the principal trades of the male workers. Of the 28 female workers, 21 were hired as canteen employees. Thirty-five cases of malignant mesothelioma (34 pleural, one peritoneal) were diagnosed among people hired in the period 1950-1959. Mesothelioma patients included 34 men aged between 47 and 82 years and one woman aged 88 years. 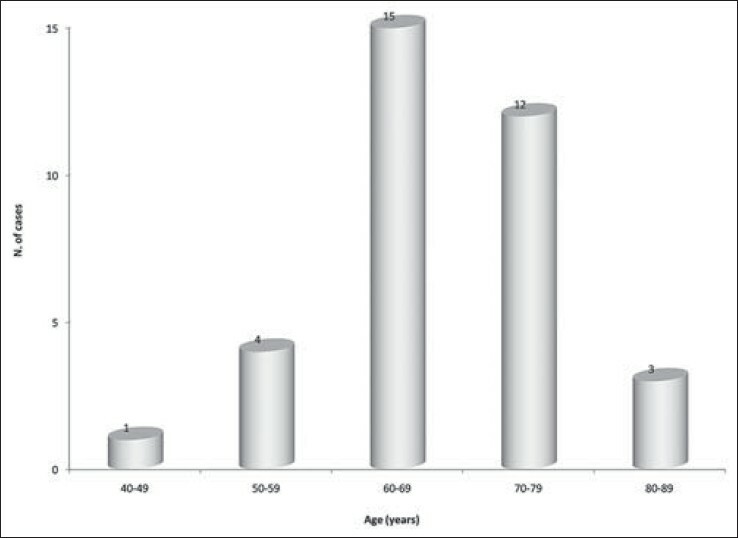 The age distribution of the patients with mesothelioma is showed in [Figure 3]. The tumors were diagnosed between 1978 and 2012. The pathological diagnosis was based on or confirmed by necropsy findings in 27 cases. In the remaining cases, mesothelioma was diagnosed on biopsy or surgical material (seven cases), or on cytological findings (one case). 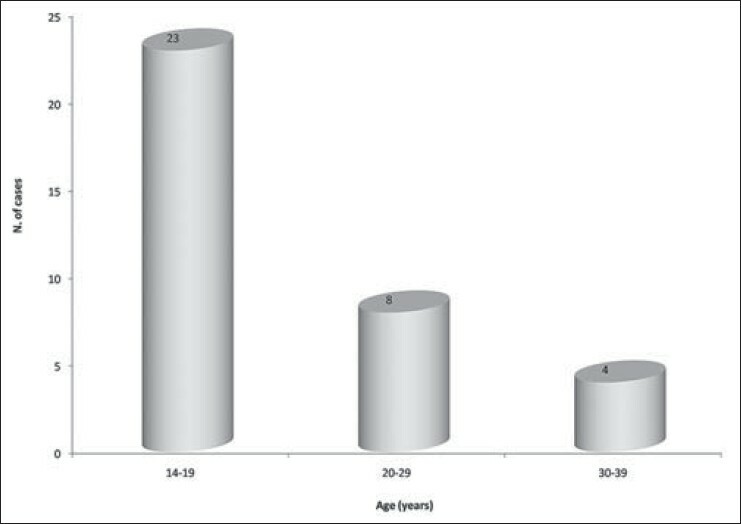 [Figure 4] shows the age distribution of the mesothelioma patients at the employment time. 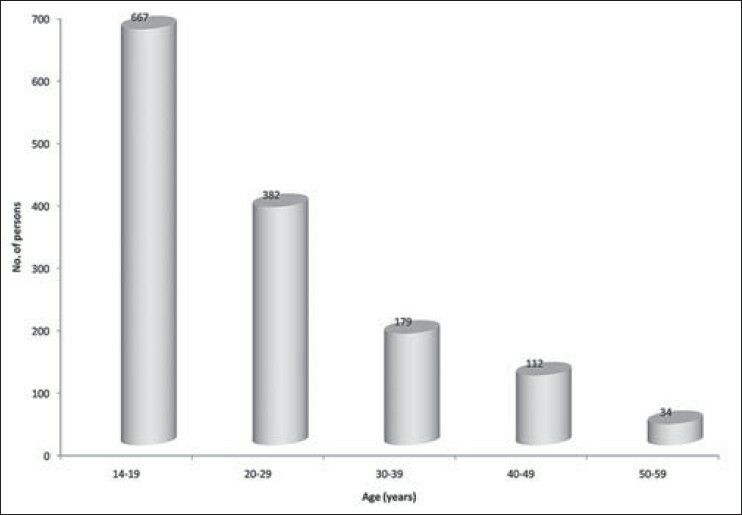 Mesotheliomas were concentrated among persons aged 14-33 years at hiring date. The highest prevalence was observed among people aged 14-19 years at hiring time [Table 1]. The differences among the various groups did not reach the statistical significance. The trades of the workers with mesothelioma were various. Not rarely, the patients had worked with more trades, with plumber (11 cases), carpenter-shipwright (ten cases), and welder (six cases) being the more frequent. Two men had histories of asbestos exposure prior to the employment in 1950s. The woman with mesothelioma had worked as a canteen employee. She had also a history of exposure to asbestos at home, having cleaned the work clothes of her husband and of her son, occupationally exposed. Of 29 patients for whom data on the employment duration were available, 28 had worked in the shipyards for more than 10 years, and 25 for more than 20 years. 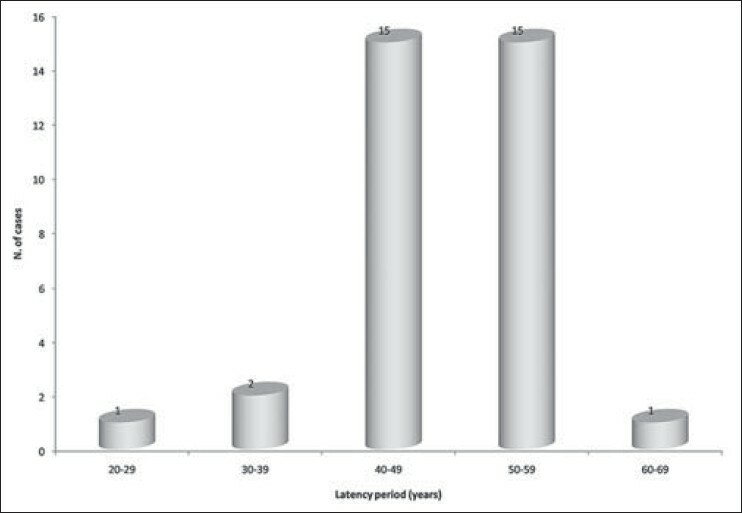 The latency periods calculated in 34 cases ranged between 25 and 68 years (mean 48.3 years) [Figure 5]. 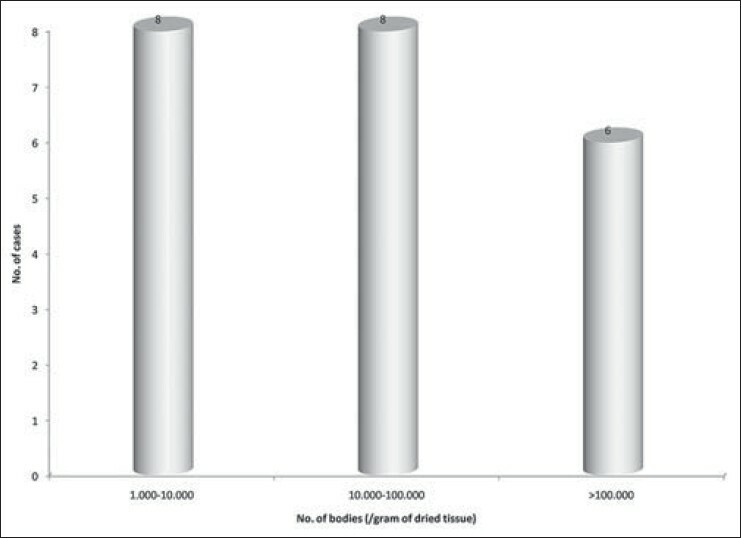 Asbestos bodies isolated in 22 cases ranged between 1,000 and 886,000 bodies per gram of dried tissue [Figure 6]. In a further six cases, the presence of asbestos bodies on routine lung sections was reported. Four men with pleural mesothelioma had a blood relative with the same tumor. Familial mesotheliomas included one couple father-son, one couple of brothers, and two couples brother-sister. Of the blood relatives, three had histories of occupational exposure to asbestos and one had a history of domestic exposure. After the destruction caused by the raids in World War II (WWII), the Monfalcone shipyards had an intense activity in the decade 1950-1959 and in the following years. Units of various types were produced; including passenger motorships and turbine steamships, turbine tankers, and warships (air carrier cruiser and many submarines). In the Monfalcone district, studies on mesothelioma began in 1979. This means that mesotheliomas developed prior to this date may be remained undetected or unregistered. Consequently, the data emerged from the present study may be underestimated. Moreover, the fact that mesothelioma cases have been observed even in 2012, suggests that further cases have to be expected as effects of shipyard work in Monfalcone in 1950-1959. Finally, archive data of Monfalcone and Trieste Hospitals do not cover all cases, especially in case of people migrating to other areas. Despite to these limitations, the prevalence of mesothelioma among shipyard workers was high. Lung asbestos bodies isolated at necropsy in 22 mesothelioma cases showed wide variations in number. In 14 cases, high burdens (more than 10,000 bodies per gram of dried tissue) were found. In evaluating these findings, it should be remembered that clearance of asbestos fibers from the lung tissue represents a mechanism by far more efficient than believed in the past. Clearance involves, although at different degrees, both chrysotile as well as amphiboles. If long time intervals have elapsed from the end of asbestos exposure, the number of lung asbestos bodies reflects only partly the intensity of occurred exposure. Moreover, asbestos body burdens in the lung tissue may differ from those of pleura. Studies conducted on lung and pleural tissues obtained at necropsy in a small group of Monfalcone shipyard workers showed that the number as well as the type of asbestos fibers in the pleura differed markedly from those found in the lung. Even with these limitations, lung asbestos body burdens offer relevant data on the entity of exposure. In general, asbestos is the cause of mesothelioma in nearly 100% of the cases. Nevertheless, the percentages of exposed people who develop mesothelioma are relatively low. This indicates the role of cofactors in the genesis of asbestos-related mesothelioma. , Such cofactors are poorly known. A lot of investigations have been devoted to familial mesothelioma. ,,, The meaning of familial aggregations in malignant mesothelioma has been variously interpreted. After the data recently reported by de Klerk et al.,  from Wittenoom, Australia, familial aggregations in mesothelioma occur more frequently than expected. This suggests an important genetic component in mesothelioma. The presence of four cases of familial mesothelioma in the present series agrees with the view that genetic susceptibility has a relevant role in asbestos-related mesothelioma. In conclusion, the current results indicate a high mesothelioma risk among workers hired at the Monfalcone shipyards in 1950-1959. A further observation period is needed to evaluate the entire impact of asbestos exposure begun in the Monfalcone shipyards in the above decade. 1. Bianchi C, Brollo A, Ramani L, Zuch C. Asbestos-related mesothelioma in Monfalcone, Italy. Am J Ind Med 1993;24:149-60. 2. Bianchi C, Brollo A, Ramani L, Bianchi T. Malignant mesothelioma of the pleura in Monfalcone, Italy. A 23-year monitoring in an area at high incidence. Eur J Oncol Library 2004;3:49-58. 3. Bianchi C, Brollo A, Ramani L. Asbestos exposure in a shipyard area, Northeastern Italy. Ind Health 2000;38:301-8. 4. Bianchi C, Bianchi T. Shipbuilding and mesothelioma in Monfalcone, Italy. Indian J Occup Environ Med 2012;16:14-7. 5. Bianchi C, Bianchi T. Shipbuilding and mesothelioma in the Monfalcone area, Italy. Trend of the epidemic. Eur J Oncol 2012;17:43-8. 6. Smith MJ, Naylor B. A method for extracting ferruginous bodies from sputum and pulmonary tissue. Am J Clin Pathol 1972;58:250-4. 7. McCaughey WT. Primary tumours of the pleura. J Pathol Bacteriol 1958;76:517-29. 8. Bianchi C. Mesothelioma and naval work. Eur J Oncol 2002;7:159-60. 9. Kolonel LN, Yoshizawa CN, Hirohata T, Myers BC. Cancer occurrence in shipyard workers exposed to asbestos in Hawaii. Cancer Res 1985;45:3924-8. 10. Danielsen TE, Langård S, Andersen A, Knudsen O. 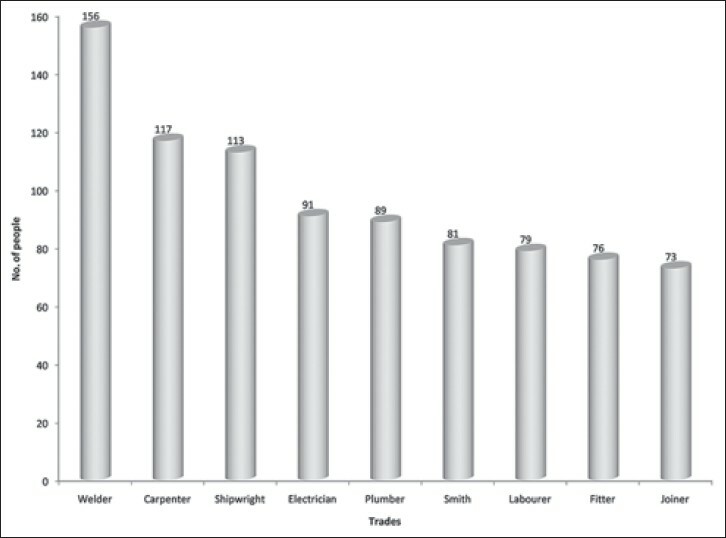 Incidence of cancer among welders of mild steel and other shipyard workers. Br J Ind Med 1993;50:1097-103. 11. Puntoni R, Merlo F, Borsa L, Reggiardo G, Garrone E, Ceppi M. A historical cohort mortality study among shipyard workers in Genoa, Italy. Am J Ind Med 2001;40:363-70. 12. Krstev S, Stewart P, Rusiecki J, Blair A. Mortality among shipyard Coast Guard workers: A retrospective cohort study. Occup Environ Med 2007;64:651-8. 13. Bianchi C, Brollo A, Bittesini L. Mesothelioma caused by asbestos in the Monfalcone area. Pathologica 1981;73:649-55. 14. Bianchi C, Bianchi T. Malignant mesothelioma of the peritoneum and heavy exposure to asbestos. Eur J Oncol 2007;12:255-8. 15. Giarelli L, Bianchi C, Grandi G. Malignant mesothelioma of the pleura in Trieste, Italy. Am J Ind Med 1992;22:521-30. 16. Bianchi C, Giarelli L, Grandi G, Brollo A, Ramani L, Zuch C. Latency periods in asbestos-related mesothelioma of the pleura. Eur J Cancer Prev 1997;6:162-6. 17. Bianchi C, Brollo A, Ramani L, Bianchi T, Giarelli L. Asbestos exposure in malignant mesothelioma of the pleura: A survey of 557 cases. Ind Health 2001;39:161-7. 18. Bianchi C, Bianchi T. Malignant pleural mesothelioma in Italy. Indian J Occup Environ Med 2009;13:80-3. 19. Hilliard AK, Lovett JK, McGavin CR. The rise and fall in incidence of malignant mesothelioma from a British Naval Dockyard, 1979-1999. Occup Med (Lond) 2003;53:209-12. 20. International Agency for Research on Cancer. IARC Monographs on the Evaluation of Carcinogenic Risks to Humans. A review of Human carcinogens: Metals, arsenic, dusts, and fibres. Lyon: World Health Organisation, International Agency for Research on Cancer;2012;100C. 21. Harding AH, Darnton A, Osman J. Cardiovascular disease mortality among British asbestos workers (1971-2005). Occup Environ Med 2012;69:417-21. 22. Barone-Adesi F, Ferrante D, Bertolotti M, Todesco A, Mirabelli D, Terracini B, et al. Long-term mortality from pleural and peritoneal cancer after exposure to asbestos: Possible role of asbestos clearance. Int J Cancer 2008;123:912-6. 23. Dodson RF, Williams MG Jr, Corn CJ, Brollo A, Bianchi C. Asbestos content of lung tissue, lymph nodes, and pleural plaques from former shipyard workers. Am Rev Respir Dis 1990;142:843-7. 24. Giarelli L, Bianchi C. Host factors in asbestos-related mesothelioma. Eur J Oncol 1999;4:541-3. 25. Bianchi C, Bianchi T. Susceptibility and resistance in the genesis of asbestos-related mesothelioma. Indian J Occup Environ Med 2008;12:57-60. 26. Bianchi C, Brollo A, Zuch C. Asbestos-related familial mesothelioma. Eur J Cancer Prev 1993;2:247-50. 27. Bianchi C, Brollo A, Ramani L, Bianchi T, Giarelli L. Familial mesothelioma of the pleura--a report of 40 cases. Ind Health 2004;42:235-9. 28. Bianchi C, Nemo A, Bianchi T. Familial mesothelioma: A puzzling issue. Eur J Oncol 2008;13:181-6. 29. Ascoli V, Cavone D, Merler E, Barbieri PG, Romeo L, Nardi F, et al. Mesothelioma in blood related subjects: Report of 11 clusters among 1954 Italy cases and review of the literature. Am J Ind Med 2007;50:357-69. 30. de Klerk N, Alfonso H, Olsen N, Reid A, Sleith J, Palmer L, et al. Familial aggregation of malignant mesothelioma in former workers and residents of Wittenoom, Western Australia. Int J Cancer 2013;132:1423-8.